Who holds power in society? How do systems of power influence people’s ability to be themselves? In this two-part episode we explore existing power structures, the identities that have and haven’t fit within those systems, and the stigmas attached to labels and experiences. 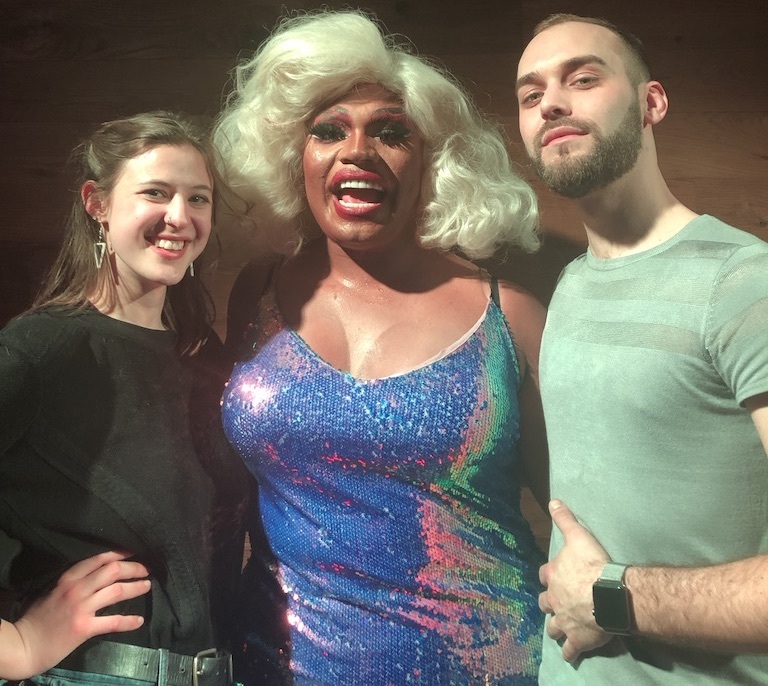 Part one features Brita Filter (Jesse Havea), an NYC-based drag queen, and Domenick Scudera, a professor at Ursinus College who teaches a class called “The History of Drag Performance: From Shakespeare to RuPaul.” We discuss gender constructs, queer identity, and the role drag has played in challenging existing structures of power. JESSE HAVEA: I think that what people don’t understand, they are afraid of. And once they do understand, they’ll take a step back and realize that there was like no need to be judgemental or afraid of this, because we’re truly just trying to make people happy. JOSHUA CROKE: How does society define who holds power? How has history shaped our perception of people and their place in society? How can people flip societal norms to reclaim power? We’ve been thinking a lot about power, and how power is more readily given to some individuals than others. We know this is a very complex issue that crosses lines of gender, race, class and more. This two-part series is just the beginning of a larger conversation. In these episodes, we will share the stories of four people, all from different backgrounds and with different lived-experiences, telling their stories about their relationship with perception and power. JESSE HAVEA: Hi how are you, I want to say a proper hello. MARIEL CARIKER: Hi, I’m Mariel, it’s so nice to meet you. JOSHUA CROKE: We interviewed Jesse Havea at Therapy Bar in Midtown Manhattan. JESSE HAVEA: You can come to my allustrious dressing room down here right by the refrigerator. JOSHUA CROKE: Jesse uses Therapy’s space during the day to rehearse performances. JESSE HAVEA: My given birth name is Jesse Havea, but most people know me as the allustrious Brita Filter, the anything but pure New York City drag queen. JOSHUA CROKE: Jesse’s been performing in drag as Brita for five years, and has been doing drag full-time professionally for over three years. JESSE HAVEA: My mom’s side of her family is like very Christian, like pentecostal. And then my dad’s side of the family is straight up mormon. My dad is from the kingdom of Tonga, in the South Pacific Islands, by like Tahiti, Fiji and Samoa. So Jesse is definitely Maui, and Brita is definitely Moana. My mom didn’t understand it. She told me I would never be a pretty woman, or a drag queen, I wouldn’t be pretty because I’m not skinny enough or I’m not like this, and I was like, little do you know I’m going to show you mom. JOSHUA CROKE: Jesse started out as a musical performer, with aspirations for Broadway. Jesse says while Broadway is becoming more diverse now, he was often typecast for roles due to his ethnicity. He says he found these shows boring, that they didn’t utilize his skills. So, he decided to take his career into his own hands. JESSE HAVEA: I was kind of sick of doing other people’s art. I really wanted to be my own artistic director and create things for myself and that was the biggest reason why I started drag, was because I was a full encompassing artistic director. Because I was in charge of every single thing I did. I was in charge of the music, what I was wearing, all of it. DOMENICK SCUDERA: Contemporary drag culture is coming from a strain of drag performance that was part of gay culture from say, the 40s, 50s, 60s, underground. And has only really emerged into the mainstream in the last decades. And that is part of that moment when the gay community was gaining more power and being able to empower themselves to be part of the mainstream cultures. JOSHUA CROKE: This is Professor Domenick Scudera. 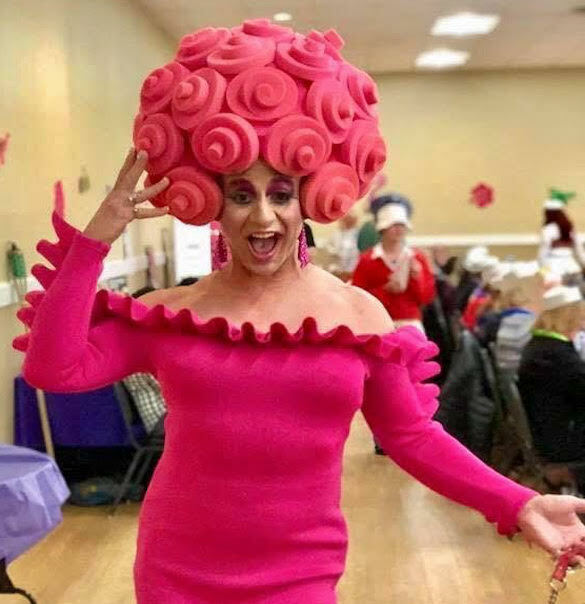 He teaches a class at Ursinus College called “The History of Drag Performance: From Shakespeare to RuPaul.” The class explores drag history, and how drag reflects and responds to culture. He asks his students, how does drag unsettle gender and societal norms through performance? DOMENICK SCUDERA: You know, if a young boy is made fun of because he’s feminine or effeminate instead of squashing that down, sort of saying, you know what, that’s part of me and I’m going to use that to empower myself to be something of my own creation. I’m taking that part of me and making it fabulous, and strong and you can’t touch me in a way. JOSHUA CROKE: Domenick is a drag queen himself, his drag persona is named Summer Clearance. Domenick’s husband is also a drag queen, named Thunder Showers. Summer and Thunder were created when they worked with the AIDS fund in Philadelphia. The two of them would host a “gay bingo” event in drag to raise money to support the cause. DOMENICK SCUDERA: So there’s about 600 people playing bingo once a month, and it’s raised millions of dollars over the years. And so we started doing that, many years ago now, and did it to help our community. JOSHUA CROKE: Although Domenick used his drag persona for charity, and he taught a class about drag, Summer never graced the classroom. Domenick was worried that by dressing in drag instead of a typical suit, he wouldn’t be taken seriously by his students. JOSHUA CROKE: Domenick had to ask himself, why does what I wear impact the way students view me as their professor? DOMENICK SCUDERA: And after I taught the class I thought, “Well that’s really stupid.” You know, that doesn’t make any sense. I’m not practicing what I’m preaching here, I’m trying to say that drag is empowering and can bring out parts of you that you are creating to make people see the best parts of you. So why wasn’t I allowing my students to see that? JOSHUA CROKE: Domenick now occasionally teaches in drag, but this issue of presentation opened up discussion about how his fellow female colleagues were treated every day. Women at his university said they had to think more carefully than their male colleagues about what they wore in the classroom. DOMENICK SCUDERA: Now some of my male professors show up in flip flops and shorts and crumpled and you know it doesn’t make a difference, and people will accept that they already have that authority. And so your presentation really does make a difference. JESSE HAVEA: Hey, you feeling good? Welcome to the All Stars 4 viewing party! My name is Brita Filter, that’s right honey, I’m coming, I’m feeling like Farrah Moan today I’m her fat brown cousin girl. JOSHUA CROKE: Jesse hosts viewing parties for RuPaul’s Drag Race at Boxers bar in Washington Heights every Friday night. JESSE HAVEA: One of these days, season 25 girl, I’m aiming for it, that’s right. Rule number one, I love applause. Rule number two, it costs a lot of money to look this cheap and not wear shoes. JOSHUA CROKE: Brita Filter has started making waves in the mainstream entertainment world. Jesse was named New York City’s 2018 Entertainer of the Year. He was on an episode of Broad City in drag. But while focusing on Brita, he didn’t give equal time to taking care of Jesse. JESSE HAVEA: When I first started drag I was like, like, okay, I have to make this happen. And when I set my mind to something, I’m going to make it happen. Like I’m going to do it. So I kind of became a little too Brita obsessed. In a sense that everything was for Brita. I did nothing for myself. And I really had this giant downward spiral and had to check myself on numerous occasions. JOSHUA CROKE: For Pride festivities in June, Jesse was hired by Google, Spotify, Uber and more to attend a corporate celebration in drag. Does a practice like drag, which turns the gender binary on its head, have a safe place in the current power structure of corporate settings? JESSE HAVEA: Walking into a space like corporate America, drag is a mask, initially, I always looked at it like a mask, like I didn’t know what I was. I would put this character on and that’s how I looked it, as a character. And I think people who are in corporate America do that as well. They’re a character. They wear this suit and they’re like, “Okay, now I go to to put it on, like this is what I’m doing.” It’s very similar. JOSHUA CROKE: Jesse says he was nervous to perform in drag in a space full of people who typically have “power” in the world of business and politics, mostly straight, white, cisgender male corporate officials. This begs the question of how can people begin to shift and change the strict rules of gender and presentation in corporate environments? JESSE HAVEA: I think it’s important for people to challenge people’s minds by like going out and doing that in work places, and going into these spaces, these giant corporate offices, for people to have a preconceived notion of me, seeing me walk into a space, and then once they see me perform, and it’s always after they see me perform, because they’re always so afraid beforehand, but then I know what to do to warm them up. DOMENICK SCUDERA: RuPaul says that “we’re all born naked and the rest is drag.” And in a way Judith Butler’s theories are saying something similar, that we are enacting our gender, we’re performing our gender constantly. DOMENICK SCUDERA: So, you know, what is wrong with me choosing the gender I want to perform? And that shouldn’t belittle you if I am creating what I want from me. It’s not meant to do anything negative to you. JOSHUA CROKE: Like how Domenick channeled Summer to help raise money for the AIDS fund, Jesse has been able to use his platform as Brita to create change and visibility for the LGBTQ community. JESSE HAVEA: I had no idea how influential my drag would be towards other people, and towards specific LGBTQ charities and homeless LGBTQ youth and our current political system and trans lives, the things that our government is taking away from them. I have a microphone in my hand every single night of the week. And there are 100 if not hundreds of people watching my show every day. And so when I say something on the mic, these people pay attention. You’re going to listen to a 6’4” man in a dress because I command the stage, but also like we have something to say. JOSHUA CROKE: Jesse -- and Brita -- are just getting started with their work in the queer community and beyond. JESSE HAVEA: I want to create good queer art and make people think and like tell stories. I’m a storyteller. Brita has taught me so much about performing and confidence. And to not be afraid of who I am. And the person that I am on the inside. JOSHUA CROKE: But what if society or the people who hold power tell you that because of your experiences and your past, you shouldn’t be confident? In part two, we speak with two individuals who took stigma and labels forced upon them, and turned those negative perceptions into outlets to create meaningful change. JOSHUA CROKE: Experience This Podcast is created and produced by Action! by Design. Action! by Design is a citizen-centered design company that helps people build better products, launch impactful campaigns, and elevate their brand. The show is hosted by me, Josh Croke, founder of Action! By Design. Our producer is Mariel Cariker. Music for this episode was created by Rob Flax. Special thanks to Boxers Washington Heights, Therapy Bar, Dylan Horn, Allie Richards, and Giuliano D’Orazio. You can find us on social media at x-p this pod. To learn more about our organization, and to see behind the scenes photos -- including Domenick in drag as Summer Clearance, and photos of us at Jesse’s show in New York -- visit our website at action by design dot co. Is there an experience or story you think we should know about? We’d love to hear from you. If you liked this episode, please consider leaving a review and telling your friends. It really helps the show. See you next week. JESSE HAVEA: Smooth jazz is shaking.